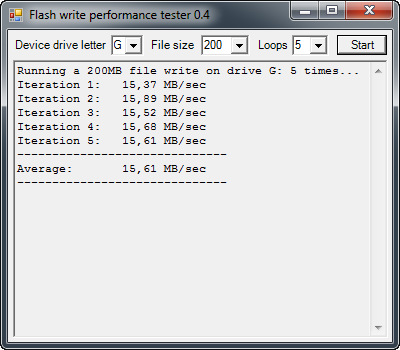 This small C# utility benchmarks the write performance in megabytes per second of a given flash drive. Temporary files of arbitrary sizes are generated and copied to the drive a number of times, whereafter an average write speed is calculated. Note that the utility uses the drive, the program is being executed from, for storage of the generated temporary test files, so reliable results depend on that drive not being the bottleneck (i.e. the read speed of that drive not being slower than the write speed of the drive tested). The performance of flash memory cards seems to be highly dependant on the card reader used. As seen in the above results, the same memory cards are more than twice as fast on the Sandisk reader than on the Hama reader. The fastest USB memory key in this test is more than six times faster than the slowest, even though they cost practically the same. "Running a " + testFileSize/1000000 + "MB file write on drive "